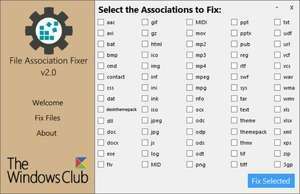 File Association Fixer is a tool which can help repair file associations in Windows, usually caused by registry errors. To fix the association for a particular file type simply click on the file type association icon or name. For security reasons, you should also check out the File Association Fixer download at LO4D.com which includes virus and malware tests. Additional screenshots of this application download may be available, too.